My dad is outside putting Brutus up. We are about to have a Buckeye Bash. It's so windy Brutus is working hard to stand up. I love when it is bowl time. Tonight we are playing Alabama in the Allstate Sugar Bowl. The game did not start off too good, but then look what happened...we are winning. Everybody was so happy. This is me with Mr. Lafferty. He is Julie's dad. Buckeyes scored again!!! But so did Alabama. Yikes. And that's when I had a breathing episode. So I had to go up and get a treatment. Then I realized Brutus needed one too. Then we decided to lay down to go to sleep. It was really late at night. But then all of a sudden I was scared. TJ was screaming so loud. I did not know what happened. He gets so crazy watching these games. In the end the Buckeyes won and now they move onto the national championship. It's my big brother's birthday. So I am baking him some of his favorite cookies. Haaa, look who is watching me. It's squirrel friend. He is getting really fat storing up for the next snow. Back to my cookies. While they are baking I have to unwrap the kisses. Then as soon as they come out of the oven I push a kiss into the warm dough. Next I print out a happy birthday sign to put on top of the container. I write Love Sarah before I tape it on. All done. I think TJ will love them. My mom is going to drive me to drop them off at his office. Today I have music therapy. We are meeting at a new church. It is cold out today. My mom backed in so it would be easier for me to walk to the car. Then she said, Sarah, we have somewhere to go. We ended up at the furniture store. We have to buy one more piece for our new quilt shop because it is just a little bigger than our old one. We were right down the street from the new Jersey Mike's. I love their turkey subs. So she took me to get one. I have to tell the guy what I want. Tomatoes, lettuce and a little bit of mayonnaise. And guess what? They gave me two chocolate chip cookies and a $10 credit card. Yippee!!! It's good to be me. Today, I have a lot of labeling to do. We are getting so much new stuff in. I have one problem. I have a bandaid on my finger which makes it hard to get these labels off. So I came up with an idea. I lifted a whole side at once. My boss told me that was a super great idea!!! Haaa, that's my mom. The mailman is here and he brought a big envelope addressed just to me. I am reading this letter and it says I am now a member of the Heights Hillcrest Regional Chamber of Commerce. This is very cool. 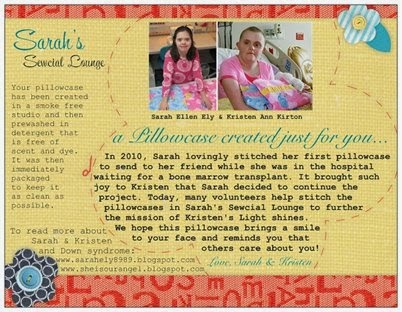 It is a certificate of membership for Sarah's Sewcial Lounge. I am now officially a business woman. I get to put a sticker on the front window. It is right under the Girl Scout sticker. And with that my mom said it was time for my name to be on our facebook page. So we changed it to Joyce Plus Sarah Ely. We tried to use the word and but it wouldn't let us. So now I sit at the computer and post things on facebook just like I do this blog. It's a little bit more current when I put it on there. This blog is only done once a month, but facebook we do almost every day. I love looking at the pictures. I have taken over my mom's desk. She said, "That's ok Sarah. I will just sit here with Brutus while you work." That makes her happy she said. I always want my mom to be happy. I took this picture. Guess where I am? My friend Jori and Catherine came with me. It's Mickey and Minnie Mouse. I love her new boots. I think they are Uggs. I love Disney on Ice. Today we are in Cleveland at the Q. Look it's Marlin and Nemo!! Did you see this mom? Today it is Frozen!!! I am so excited. It's over. That always makes me sad. I love Disney on Ice so much. Elsa and Anna did a really good job today. As soon as the show was over, this really nice man came to help me. These steps can be a little scary for me. Meet Wendel Van Sickle. His name tag says he is an Event Coordinator. To me he was like my prince charming. He took me right to the place that had my wheelchair hiding. And then he took me all the way to the car. He even took us up a private elevator to beat the crowd. Thank you Mr. Van Sickle!!! I was so happy that Jori was able to come with us. She goes to college in New York City. She was home on break. She loves Disney just like I do. OMG!!!!!! Look at this. It is a super huge chandelier hanging over Euclid Ave. at Playhouse Square. Very cool. It was getting late and I had not eaten, so my mom said we could go anywhere I wanted. I chose Burger King. I wanted to eat in the car. On the way over there we spotted Matt's car on the street. He was not where he said he was going to be. Uh oh. I think he's in trouble now. Today is January 14th. As soon as I walked in to Cutters Creek I said, "Happy Birthday Grandpa!" He liked that. Oh yea!!! Look at this. My new shirt arrived. It fits perfectly. OHIO STATE 2014 NATIONAL CHAMPIONS!!! They beat the Oregon Ducks for this title. Look who is waiting for me when I got home today. Bambi I and Bambi II. They are always hanging around our house. Look at this!! I can dance in the aisle at our quilt shop with my new speaker. It picks up the music on my iPod. I can sit it on the counter when I am working too. The customers think I am cute. Look at this new fabric. It is Paddington Bear. I think I want to go see the new movie. Have you seen it yet? I have to get to work now. I have a lot of sewing to do. I am putting the binding on this quilt. It is going to be listed in an auction to help bring a little girl home who is living in an orphanage. 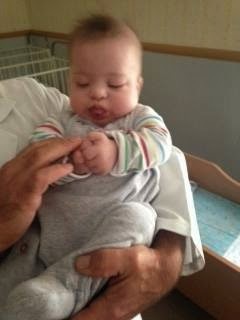 She has Down syndrome just like me. Now I am onto the finishing touch. The final stitch of the binding, I have to be extra careful because it has to be really straight. I am not quite done yet. I always include a matching pillow case and this one needs pressing. Hey where is everybody? Peek-a-boo!! It's too late to bid on the quilt but you can still help by clicking here and making a donation. Her name in the orphanage is Starr. I am at David's Bridal. They were waiting for me. No I am not getting married. It is almost time for my 25th anniversary photo shoot for my open heart surgery. I really like this dress but it just came out so the red is not ready yet. This one is not bad. It comes in red, but they have to order it. This one is red but it is way too long and my mom does not really want to hem all the ruffles. So I put this one back on. I really like it. But then two groups of bridesmaids came in. One group was wearing really strong perfume and the other group all had a smoke before they came in. I was gasping for air. So my mom very quickly got me dressed and we ran out without buying a dress. Oh well, maybe next time. OMG!!! It will not stop snowing and it is so cold. Good thing we found this really warm new coat with a hood that fits me perfect. ...and I add the card and seal them up. We already have five bags filled. Here is the card we put in with each pillowcase. It talks about Kristen and me. That's it for January 2015. Be safe everyone!! Love Sarah. It sounds like a good month. I hope you get a nice cress for your photo shoot. Red is your color.